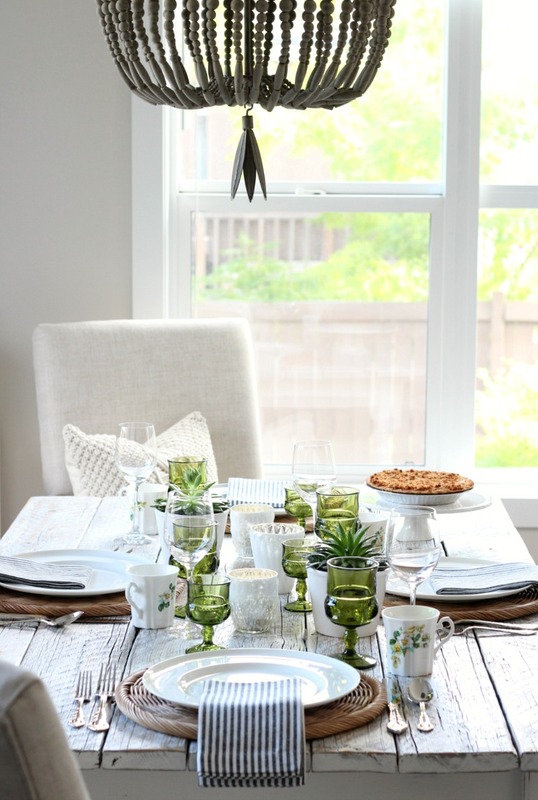 See how I set this eclectic fall tablescape using vintage green glassware, thrifted floral mugs, pretty gold flatware and other beautiful decor pieces. With the brisk temperature drop last week, decorating for fall only seemed fitting. Actually, it’s my favourite season to switch things up. A while ago, Alicia from A Burst of Beautiful asked me to be part of her fall tablescape tour (more on that below), and I immediately knew what my jumping off point would be. Some of the links in this post are affiliate links which allow me to make a small commission from your purchase without an additional cost to you. Thanks for your support! You see, I inherited this set of vintage green goblets a few years ago, and they fit perfectly with the moody fall vibe I’m drawn to right now. I know, a bit of a departure from the light, bright and airy decorating style I tend to go with. It’s funny how we’re drawn to certain colours at times (sometimes obsessed), then it completely changes. 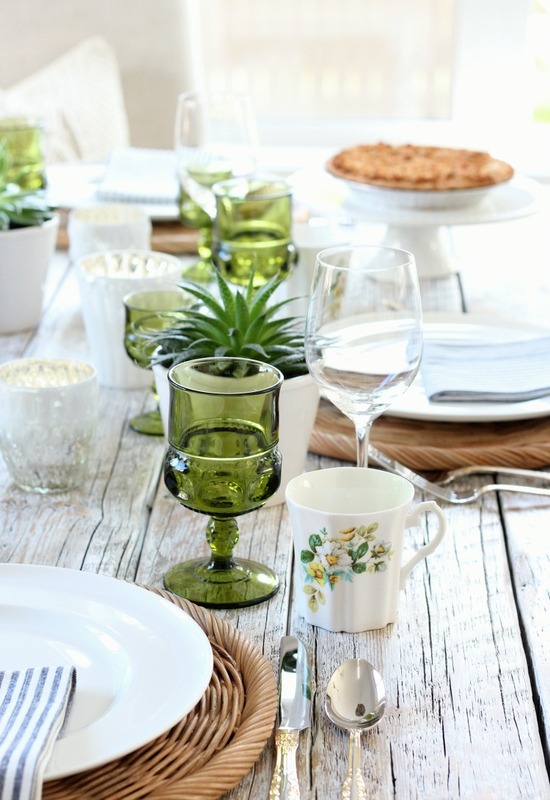 To tell you the truth, I pulled this green glassware out for last fall’s table setting, but I just wasn’t feeling it. 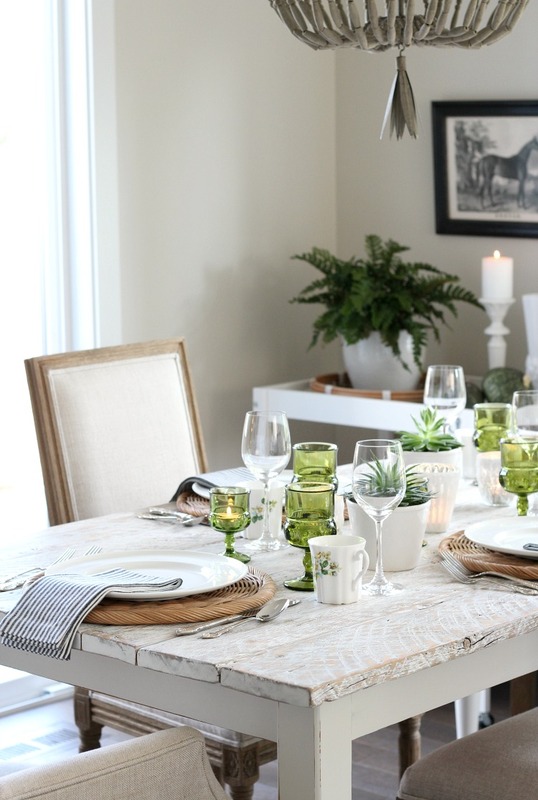 This time, pairing the avocado green with touches of black, white and gold worked for me. Those cute vintage mugs I found at the thrift shop pulled the whole tablescape together. Seemed only fitting that I added a small touch of blue-green since it’s my favourite colour (next to white). Of course, it helps that our cabinet is a similar shade. Sometimes I wonder how I’m lucky enough to find this stuff at the right moment. Does it happen to you too? Other times, however, I search and search and search… It’s okay, though. The hunt is part of the fun. Feel the same way when it comes to thrifting? 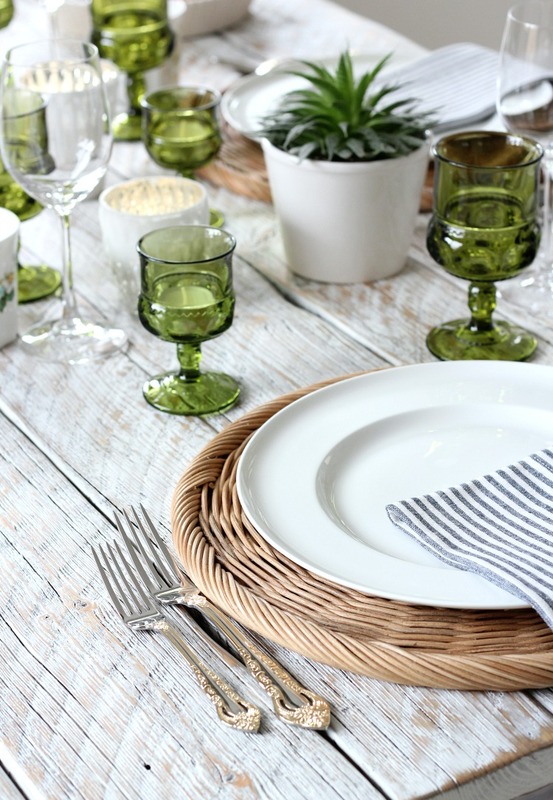 I think mixing pretty pieces like the gold flatware and floral mugs, along with the wicker chargers helped tone down the gothic style of the glasses. I love mixing varying pieces, new and old, to create an eclectic feel. If you’re more of a blue person, be sure to check out this table decorated for fall with all kinds of thrift shop finds. 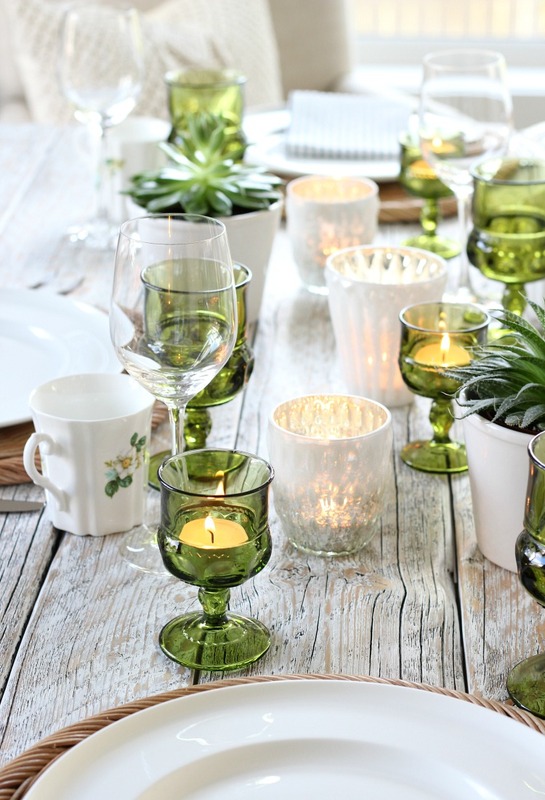 I used a few of the green cordial glasses as tea light holders. In my opinion, candlelight makes a table setting, especially in the darker months. I love the shimmery mercury votive holders I picked up on a recent shopping trip. I’m certain you’ll be seeing them over and over again. You can never go wrong with metallics, right? The succulents have been living happily our table for months. Everyone who comes over pokes them to see if they’re real, it’s quite funny. They seem to thrive in our kitchen with the occasional watering (when I remember). Needless to say, fall is all about the delicious food. 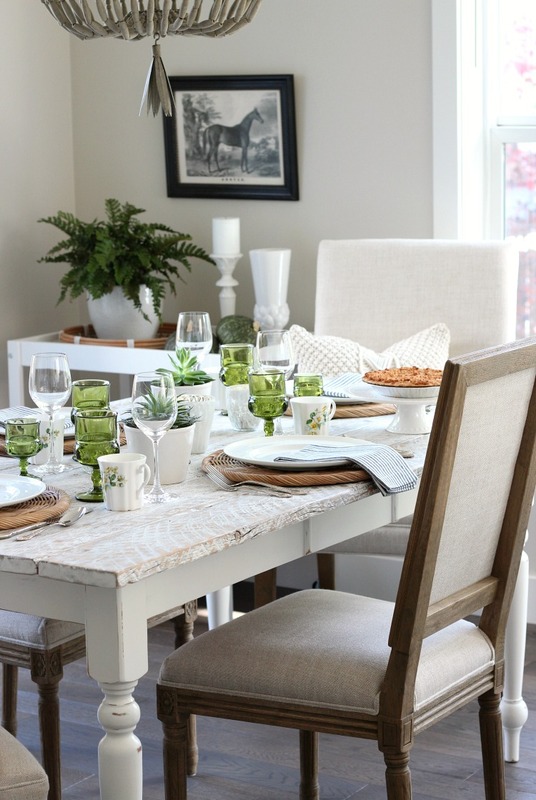 Fresh produce, the baking… I look forward to many meals shared around this table with family and friends. It’s hard to believe Canadian Thanksgiving is only 3 weeks away. Can’t wait! Apple crumble pie anyone? Perhaps you’d like a scoop of ice cream too? Hopefully you’re thinking about the pieces you have tucked away and how you can use them in a fresh new way. 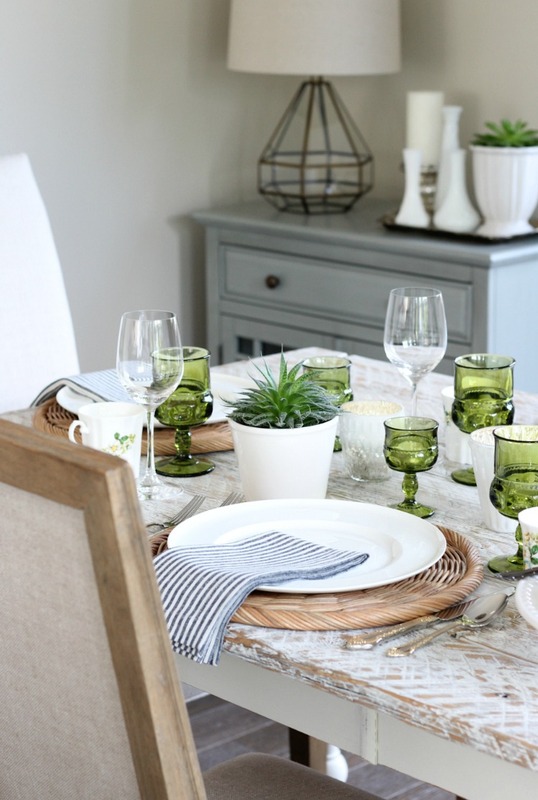 Seasonal decorating is all about adding small touches to the furniture and decor you already have in your home. Of course, it’s always fun to pick up some new decor pieces. Sources for my eclectic fall tablescape are listed below, and you can check out more items from our home here. 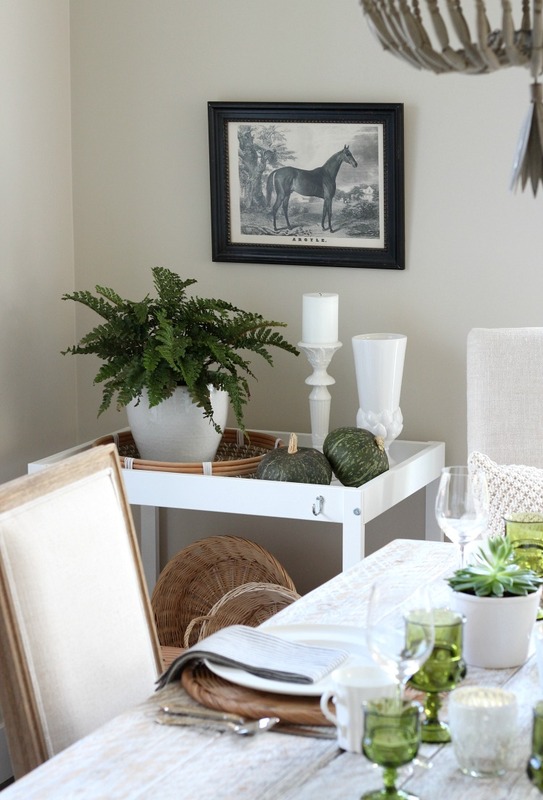 Now, be sure to stop by and visit each of these beautiful fall tablescapes put together by some of my friends. I just know you’ll be inspired! Before you head out, I invite you to SUBSCRIBE to get more decorating ideas like these delivered straight to your inbox. I’d love for you to join our growing community of home and garden enthusiasts! Beautiful! 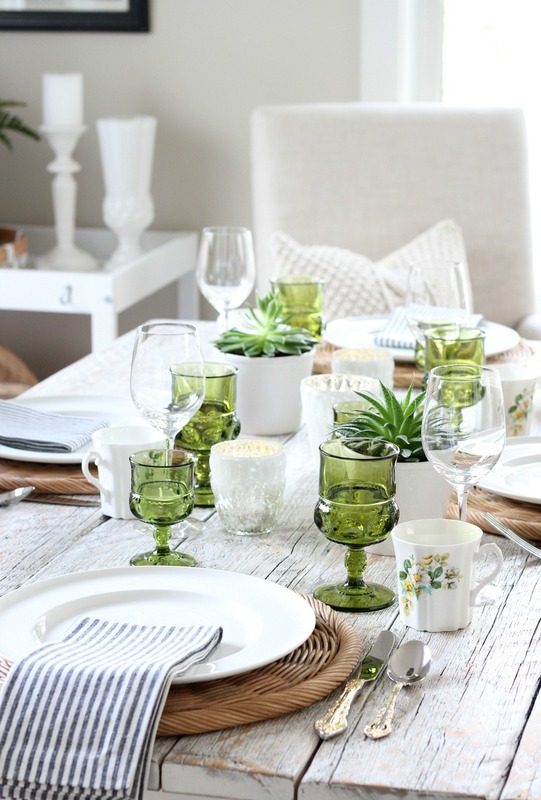 I love the green glassware – it really makes a statement on your table. A fresh look for fall! 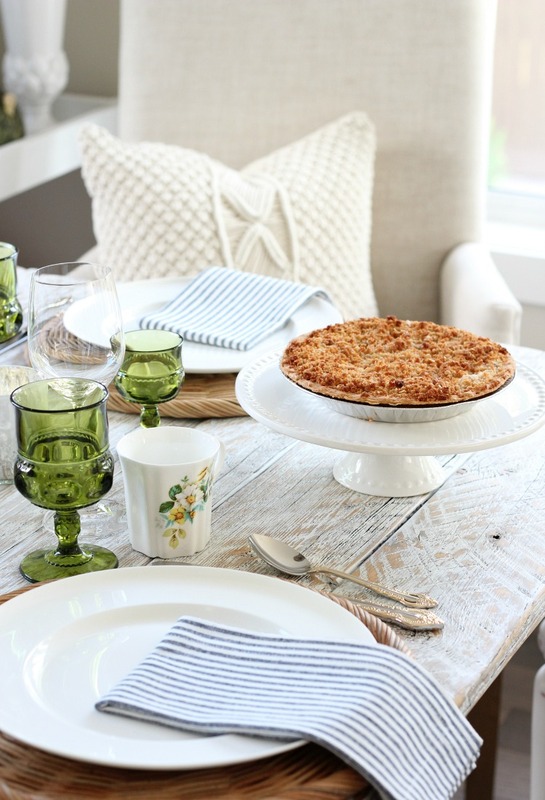 Three things … that pop of green is PERFECTION, those mugs are so cute, and pass me a piece of that pie! YUM!! Thank you, Michael! I’m loving that green colour right now too and couldn’t resist those mugs when I saw them at the thrift shop. Of course, I wish you could serve you a piece of that pie. Sending a virtual slice (hey, lower calories ha ha)! What a pretty combination of colors, Shauna! So sweet of you to say. Of course, I love your neutral setting too!